Conventional motion simulators use mechanisms call a linear actuator, which is a motor that turns a big screw which pushes a rod. They’re pretty simple devices and quite useful for motion. The more actuators you add the more degrees of movement you can get. The problem is that as soon as you want heave (up and down) you need the actuators to lift a lot of weight. If the average man weighs 90kg and then you add a seat and platform to sit on, this quickly adds up. You might use three actuators to simulate lift, pitch and roll but the problem is lifting everything at a fast enough speed to generate realistic forces. Moving the platform down isn’t a major problem since gravity does a lot of work, but lifting a human quickly requires a lot of power. Motion simulators that generate rapid movement use very powerful linear actuators which of course are extremely expensive. So we looked at the general principles involved and hope to develop something just as good but far, far more affordable. Imagine a man sitting on a see-saw alone. His 5 year old grand daughter has no chance of lifting him up does she? But if someone else sits on the other side of the see-saw she should be able to do it easily since everything is balanced. This was one of our initial ideas to add heave, use some levers beneath the base which were counter balanced with regular weights you find in any gym or discount store. This was a little tricky to compress into a small space since we could need about 150kg (or more) of weight to balance the sphere and person inside. The weights are fairly inexpensive, but do add another cost to the system. The other issue is one of mass and inertia, since whenever you move the platform you’re lifting it’s weight and pushing down the balance weights. The system might be balanced but you need to move 300+ kg now instead of 150kg. Now imagine that instead of another person on one side of the seesaw we have a big spring pushing down. The man is balanced and his grand daughter can still move the seesaw but it’s a little easier since there is less weight and inertia. The spring is also light and reasonably compact (compared to big weights), but they need to be engineered so would probably be quite expensive. So instead of a spring force to PUSH the platform up we can also use an elastic force to PULL the platform up. A large black elasticated band stretches from the bottom left side over one of the red rollers at the top and then down to pull the piston of the linear actuator up, before completing the loop on the right side. The strength of the lifting force can be adjusted by changing where the band is connected to the base, so adults and children can use the platform quite easily. Once the user climbs onto the platform their weight is supported by the lifting force of the band, the platform is in a state of equilibrium. The linear actuator now pushes the platform up and requires less power to do so, but it also uses the same power to pull the platform down. Gravity no longer helps, but a much more affordable motor can be used to do the work. Many actuators also use very expensive servo motors too, which have better ‘holding torque’ than regular motors, but if the band is holding up the platform a standard, cheap, motor can be used instead. Have you thought about having a universal joint in the middle supporting the seat of your mini simulator? That way I think since you’re only tilting the seat, the actuators could move faster or have a lower motor cost? I’m interested in a relatively low cost simulator that will exactly mimic pitch and roll of a vehicle in racing sims. Depends if you want heave or not. 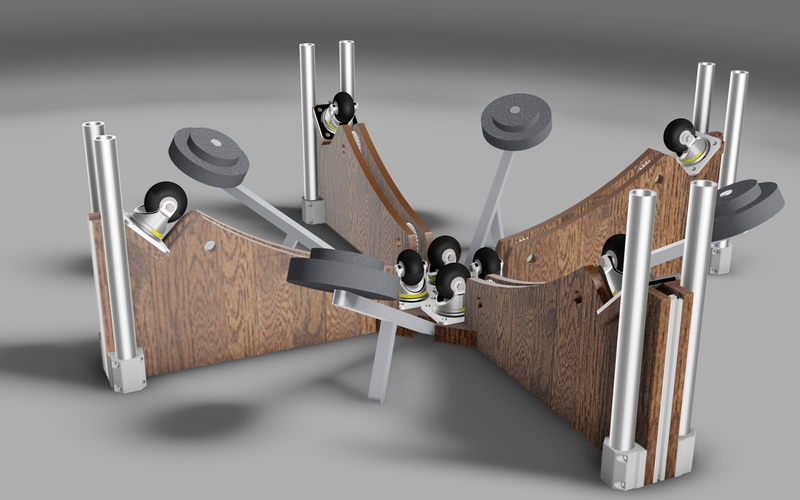 Yes, that would be an option… balance the platform in the center and use only two motors to simulate pitch and roll. Remember that it would then be incredibly easy to add another actuator to the system to incorporate heave later on. Or then add another for rear end sway… if you want to feel when your rear wheels are getting away from you then a simple 4DOF system is great.